Inder Loves Folk Art: Bird ornaments. 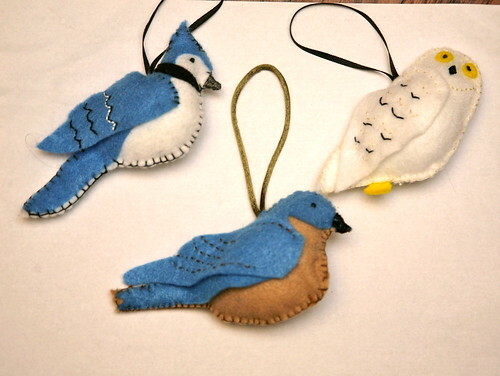 I found a fantastic blog, Downeast Thunder Farm, full of wonderful felt bird ornament patterns. So far I have made a Blue Jay, an Eastern Blue Bird, and a Snowy Owl. These are so fast, fun, and addictive to sew, I might keep making them even after Christmas! After an insanely busy holiday season and much last minute shopping (and a tiny bit of crafting), I think I am finally ready for Christmas and can maybe even relax a little? I hope that those of you who celebrate Christmas have a wonderful, wonderful holiday! Merry merry Christmas to you and yours, Inder. Wow! Those are gorgeous! A tree full of handmade bird ornaments sounds perfect! I adore that blue jay one! Wishing you a very merry Christmas and a happy new year!